We’d love to hear from you. For immediate assistance or if trying to reserve a seat in one of our classes please call us at (212) 279-6980(212) 279-6980. Our office hours are Monday – Thursday 11:00AM – 6:00PM EST. Otherwise please fill out the form below in as much detail as possible and we can contact you the next business day. 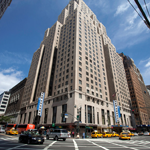 The New Yorker Hotel is two short blocks north of Penn Station. Located between 34th & 35th St in the Garment District. Click here to get directions.